Islamic Cairo (Arabic: قاهرة المعز‎, Qahirat al-Maez) is a part of central Cairo around the old walled city and around the Citadel of Cairo which is characterized by hundreds of mosques, tombs, madrasas, mansions, caravanserais, and fortifications dating from the Islamic era. In 1979, the United Nations Educational, Scientific and Cultural Organization (UNESCO) proclaimed Historic Cairo a World Cultural Heritage site, as "one of the world's oldest Islamic cities, with its famous mosques, madrasas, hammams and fountains" and "the new centre of the Islamic world, reaching its golden age in the 14th century." A typical House with Mashrabiya in Islamic Cairo. Egypt was conquered by Arab Muslims under 'Amr ibn al-'As in 641. Alexandria was then the capital of Egypt. However, even though the Arabs admired Alexandria's glamor and wealth, they chose to establish a new capital on the east bank of the Nile. That site would not be separated by water from Medina, then the residence of the Caliph. Here, the 'Amr ibn al-'As Mosque was built, the first mosque in Africa. Later rulers added many additional mosques and palaces in the area around 'Amr Mosque. Islamic Cairo, also referred to as Medieval Cairo or Fatimid Cairo, was founded in 969 as the royal enclosure for the Fatimid caliphs, while the actual economic and administrative capital was in nearby Fustat. Fustat was established by 'Amr ibn al-'As following the conquest of Egypt. Al-Askar, located in what is now Old Cairo, was the capital of Egypt from 750 to 868. Ahmad ibn Tulun established al-Qata'i as the new capital of Egypt, and it remained the capital until 905, when the Fustat once again became the capital. 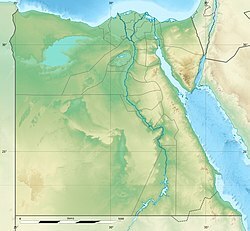 After Fustat was destroyed in 1168/9 to prevent its capture by the Crusaders, the administrative capital of Egypt moved to Cairo, where it has remained ever since. It took four years for the general Jawhar al-Siqilli (the Sicilian) to build Cairo and for the Fatimid Caliph al-Muizz to leave his old capital Mahdia in Tunisia and settle in the new Fatimid capital in Egypt. Muizz Street goes through Islamic Cairo has great concentration of bazaars and Islamic architectures. Later, during the Fatimid era, Al-Qahira (Cairo) was officially founded in 969 as an imperial capital just to the north of Fustat. Over the centuries, Cairo grew to absorb other local cities such as Fustat, but the year 969 is considered the "founding year" of the modern city. In 1250, the slave soldiers or Mamluks seized Egypt and ruled from their capital at Cairo until 1517, when they were defeated by the Ottomans. By the 16th century, Cairo had high-rise apartment buildings where the two lower floors were for commercial and storage purposes and the multiple stories above them were rented out to tenants. 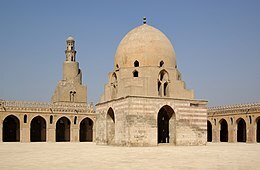 While the first mosque in Egypt was the Mosque of Amr ibn al-As in Fustat, the Mosque of Ibn Tulun is the oldest mosque to retain its original form and is a rare example of Abbasid architecture, from the classical period of Islamic civilization. It was built in 876–879 AD in a style inspired by the Abbasid capital of Samarra in Iraq. It is one of the largest mosques in Cairo and is often cited as one of the most beautiful. After Cairo was founded to the northeast of Fustat in 959 AD by the victorious Fatimid army, the Fatimids built a separate palatial city which contained their palaces and institutions of government. It was enclosed by a circuit of walls, which were rebuilt in stone in the late 11th century AD by the vizir Badr al-Gamali, parts of which survive today at Bab Zuwayla in the south and Bab al-Futuh and Bab al-Nasr in the north. Khan el-Khalili, a major souk in Islamic Cairo. Islamic Cairo is also the location of several important religious shrines such as the al-Hussein Mosque (whose shrine is believed to hold the head of Husayn ibn Ali), the Mausoleum of Imam al-Shafi'i (founder of the Shafi'i madhhab, one of the primary schools of thought in Sunni Islamic jurisprudence), the Tomb of Sayyida Ruqayya, the Mosque of Sayyida Nafisa, and others. Much of this historic area suffers from neglect and decay, in this, one of the poorest and most overcrowded areas of the Egyptian capital. In addition, as reported in the Al-Ahram Weekly, thefts at Islamic monuments inside the Darb Al-Ahmar threaten their long-term preservation. ^ e.g. O'Neill, Zora et al. 2012. Lonely Planet: Egypt (11th edition). ^ Irene Beeson (September–October 1969). "Cairo, a Millennial". Saudi Aramco World. pp. 24, 26–30. Retrieved 2007-08-09. ^ Williams, Caroline. 2008 (6th ed.). Islamic Monuments in Cairo: The Practical Guide. Cairo: American University in Cairo Press, pp. 50–54. ^ Williams, Caroline. 2008 (6th ed.). Islamic Monuments in Cairo: The Practical Guide. Cairo: American University in Cairo Press, p 50. ^ O'Neill, Zora et al. 2012. Lonely Planet: Egypt (11th edition), p. 87. ^ Raymond, André. 1993. Le Caire. Fayard, p. 62. ^ a b Williams, Caroline. 2008 (6th ed.). Islamic Monuments in Cairo: The Practical Guide. Cairo: American University in Cairo Press, p. 169. ^ Raymond, André. 1993. Le Caire. Fayard, pp. 90–97. ^ O'Neill, Zora et al. 2012. Lonely Planet: Egypt (11th edition), p. 81. ^ Williams, Caroline. 2008 (6th ed.). Islamic Monuments in Cairo: The Practical Guide. Cairo: American University in Cairo Press. ^ Ancient Cairo: Preserving a Historical Heritage, Qantara, 2006. ^ Unholy Thefts Archived 2013-06-05 at the Wayback Machine Al-Ahram Weekly, Nevine El-Aref, 26 June - 2 July 2008 Issue No. 903.